if you want an 'experience' – read Dane Rudhyar". These words, so resonant and strangely familiar, had a profound effect on me, confirming the power of the astrological language … to articulate with respect the delicate mysteries of what it is to be human, and in so doing to transform our experience. I had been 'star-struck', and in that very moment dedicated myself to learning astrology, and to following wherever it would lead me. The vocation that had presented itself eleven years earlier clicked into place, and the 'Wheel of Fortune' had turned. In 1971, having re-located to England, I lived in a community focalised by the Sufi teacher Fazal Inayat Khan, then the director of Servire Publications, one of the first publishers to take Rudhyar's work seriously. Imagine my astonishment when I discovered this connection, unknown to me beforehand! The Wheel of Fortune had turned again, bringing easy access to most of Rudhyar's published works. 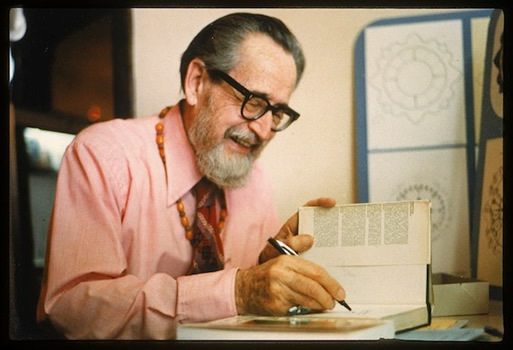 Later, Fazal introduced me to him personally at his California home; in autumn 1975 I also attended a seminar given by Rudhyar at the New York Astrology Centre. I vividly remember his exasperated response to a question asked by an eager student. He rolled his eyes, clapped his hands to his head and said, in true Sun in Aries fashion, 'I've been trying the explain that for forty years! Why don't you read my books?' As you can imagine, jaws fell and eyes widened! My next visit to New York was in 2012, offering a seminar as the guest of NCGR. I began the day by mentioning the 1975 seminar and asked if, by chance, anyone in the room had been there. You guessed it – somebody had! Another 'moment', another turn of the Wheel. Rudhyar was born Daniel Chennevière, in Paris in 1895. At the age of 13, he had one kidney surgically removed, so was declared unfit for active military service during the 1914-18 war. Libra rules the kidneys, and in Rudhyar's horoscope we see a prominent Chiron in Libra in the 9th house, conjunct the MC; the South Node was conjunct natal Chiron by Solar Arc Direction in the year of his surgery.6 In spite of this affliction, resulting in life-long health challenges also suggested by the triple conjunction of Pluto, Mars and Neptune in the 6th house, he lived to the age of 90, having offered his ideas and creative expression as a healing influence to a world in turmoil. Rudhyar was also something of a musical prodigy, and by the age of seventeen was already composing original work. 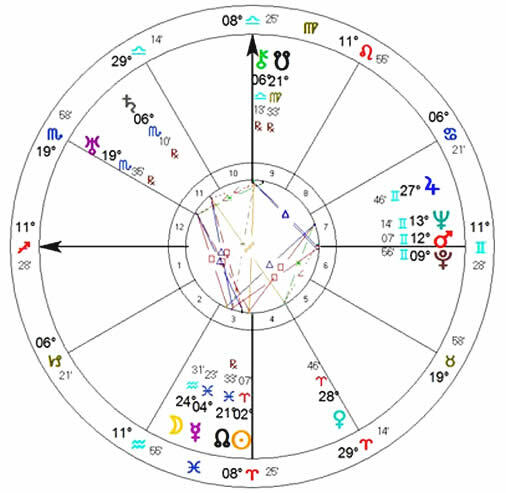 His father had died the year before: Mars rules Rudhyar's Aries Sun, Venus and IC, all signifying 'the father', and by Solar Arc Direction, Mars was then conjunct his Jupiter, often present in the signification of death. Natal Mars is closely conjunct Neptune, signifying his musicality. A composition of his premiered in New York, the first ever performance of 'dissonant polytonal' music (Mars-Neptune), given the very week that America entered WWI. Rudhyar's musical influences and associates were numerous and illustrious. After travelling to the USA in 1917, and while experiencing considerable hardship, Rudhyar spent much time reading in the public library of New York. Alchemy, Rosicrucianism, Blavatsky's writings and Eastern philosophy all imbued him with ideas that would later flower in his own astrological work. He had already rejected his ancestral name, and with it his allegiance to the 'Old World' which he saw as epitomising the degenerating 'autumn phase' of Western Civilisation. Here too is the signature of Chiron in Libra in the 9th house, opposite Sun widely conjunct the IC – interest in ideas from 'foreign' cultures, migration, rejection of 'birth-right', taking on a new nationality and a mythic identity. He saw himself as a 'Seed Man'; he sought and found fertile ground in which to thrive, attracting sponsorship from a number of eminent people. The name 'Rudhyar' derives from 'Rudra', the Hindu storm god associated with Mars. Publishing, studying the mysteries, learning astrology, meeting a teacher and fellow philosopher all relate to the 9th house, home of Rudhyar's Chiron and South Node. Rudhyar met astrologer Marc Edmund Jones whose group was known as the 'Sabian Assembly'. In 1931, Jones published work on the 'Sabian Symbols' a set of 360 symbols for the degrees of the zodiac. This material was shared with Rudhyar, who later went on to write his own interpretations of the symbols in the book 'Astrological Mandala'. During the years that followed, Rudhyar immersed himself in the philosophical works of Carl Jung, Henri Bergson, Roberto Assagioli whom he befriended, and Jan Smuts, who first articulated the notion of 'holism' which dove-tailed with Rudhyar's early understanding of the cyclic nature of life and time. 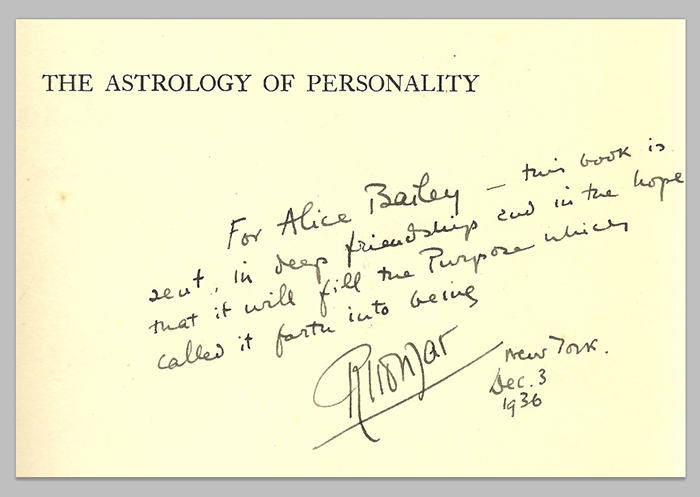 In 1933, Rudhyar's astrological work came to the attention of Paul Clancy, whose magazine 'The American Astrologer' was a seminal influence in bringing astrology to the attention of a wider public. Soon Rudhyar was writing two or three long articles monthly, the beginning of an outpouring of material as inspirational as it was prolific. In the late 1930s, Rudhyar's career as an artist also blossomed. Dane Rudhyar will remain for posterity the greatest astrologer of the 20th Century, whose broad-ranging, deeply poetic and synthesising vision influenced millions of people. First published in the November 2013 edition of the printed Journal of Astrological Association of Great Britain, a special editon on the theme of 'Inspirations'. Click here for the AA website. Grateful thanks to Leyla Raёl Hill for supplying the photograph of Rudhyar which heads this article. 2. This original 1943 edition may still be found for sale. 3. Shambala Publications, Inc., Berkeley, CA, 1970. 4. Available online at the Rudhyar Archives, www.khaldea.com. For audio recordings, click HERE. 6. November 1908, Mean Node. 7. Lucis Pub. Co., NY, 1936. 10. "New Mansions for New Men", Servire, Wassenaar, 1971, p. 100.